Sunday is smorkin’ fried chicken day. 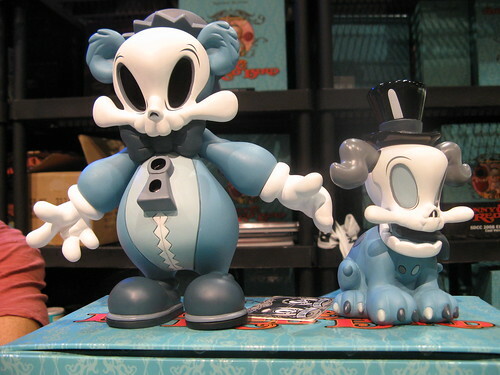 Monger by Frank Kozik. This entry was written by Jot, posted on 16/01/2011 at 15:28, filed under Designer Toys, Foto, Nasza kolekcja and tagged kozi, mongers. Leave a comment or view the discussion at the permalink and follow any comments with the RSS feed for this post. Mamy na sprzedaż lub na wymianę na coś dużego ładny i limitowany tylko do 200 sztuk zestaw: Mr. Muggles and Slap Happy : Blue Version stworzony przez Brandta Petersa. This entry was written by Jot, posted on 14/01/2011 at 13:42, filed under Designer Toys, Foto, Sklep. Leave a comment or view the discussion at the permalink and follow any comments with the RSS feed for this post. KAWS COMPANION (Passing Through) at The Aldrich Contemporary Art Museum from Paper Fortress on Vimeo. This entry was written by Jot, posted on at 10:34, filed under Media, Video, Wystawy and tagged kaws. Leave a comment or view the discussion at the permalink and follow any comments with the RSS feed for this post. This entry was written by Jot, posted on 13/01/2011 at 13:30, filed under Designer Toys, Media and tagged azteca, dunny. Leave a comment or view the discussion at the permalink and follow any comments with the RSS feed for this post. Reach, wyciagniety w leniwa niedziele z blind boxa. This entry was written by Jot, posted on 09/01/2011 at 21:06, filed under Designer Toys, Foto, Nasza kolekcja and tagged fatcap, reach. Leave a comment or view the discussion at the permalink and follow any comments with the RSS feed for this post. Co można trafić w Blind Boxach? Element niespodzianki i oczekiwania na to co kryje pudełko jest dla nas jednym z ulubionych elementów w kolekcjonowaniu winyli. O to co w niedawno zakupionych od nas blind boxach znalazł Mario Ruczkowski (ruczkowski.com). This entry was written by Jot, posted on 07/01/2011 at 15:13, filed under Designer Toys, Foto and tagged 2010, dunny, sklep, smorkin labbits. Leave a comment or view the discussion at the permalink and follow any comments with the RSS feed for this post. ¡Viva Azteca! Czternastu atystów, 18 nowych designów! Fiesta zaczyna się pod koniec stycznia, mam nadzieję że do nas dotrze na początek lutego. Czekamy! This entry was written by Jot, posted on 06/01/2011 at 17:42, filed under Designer Toys, Foto and tagged azteca, dunny. Leave a comment or view the discussion at the permalink and follow any comments with the RSS feed for this post. Magnus Atom – artysta i jeszcze zdaje się student stworzył niesamowitą animację 3d o jednej z najlepszych platform DIY, MUNNY. This entry was written by Jot, posted on 04/01/2011 at 21:44, filed under Media, Video and tagged munny. Leave a comment or view the discussion at the permalink and follow any comments with the RSS feed for this post. This entry was written by Jot, posted on at 13:20, filed under custom, Video and tagged dunny, skull. Leave a comment or view the discussion at the permalink and follow any comments with the RSS feed for this post. This entry was written by Jot, posted on at 08:35, filed under Video and tagged toybreak. Leave a comment or view the discussion at the permalink and follow any comments with the RSS feed for this post.